Simply apply to inside of band and it dries to a clear, soft plastic. Great for joining 2 bands or making clip-on earrings more comfortable. Can be peeled off for resizing. Includes 2 applicators. 5.5 gram tube. Silicone/rubber. Octamethylcyclotetrasiloxane, Hexamethyloisilazane, Methyltimethoxysilane, Methoxpolydimethylsiloxane, Siloxanes & Silicones, Dimethylpolymers W/Methylsilsesquioxanes, Polydimethylsiloxane, Treated Filler and Treated Fume Silica. - Make sure that the inside surface of the ring is clear (NO RESIDUE) and dry in order to obtain a solid bond of the solution to the metal. - Apply the solution to the inside band of the ring. - DO NOT USE YOUR FINGER TO SMOOTH OUT THE SOLUTION. Use a toothpick, paper clip, etc. to smooth out the solution. - The amount of solution you use will depend upon the size reduction you desire to make to your ring. - Use a very small amount of the solution if you just want to keep the ring from twisting on your finger. - When converting a ring size 7 to 6 you need only apply solution on 20% to 25% of the inside surface of the ring. - We suggest that if a larger ring reduction is desired, more of the inner surface of the ring should be covered with the solution instead of building up the amount of solution you use in a small surface area of the ring. Both methods will work. 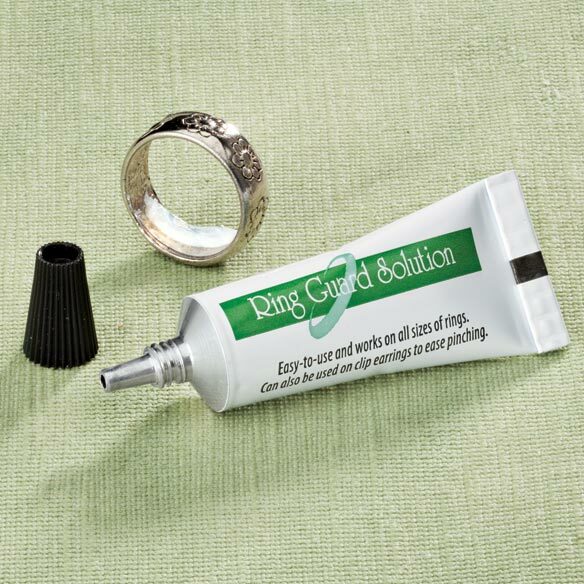 - If after applying Ring Guard Solution, the ring size still needs to be smaller, just add more of the gel over the gel that is already on the ring. It will bond to itself. - Can also be used to join (stabilize) sets as well as to reduce size. - If you find excess on the side of the ring once the solution is dried (cured), remove that excess by scraping it off using your fingernail. - Let the solution dry (cure) for 3 hours. - Peel off to remove. DO NOT USE THE RING UNTIL THE SOLUTION IS THOROUGHLY DRY (CURED). - The solution may take longer to dry (cure) in some locations due to changes in indoor temperature and humidity. - Make sure that the surface of the pad and back of the earring are clean (no residue) and dry. - Apply the solution to the pad. Apply an equal amount to that spot on the back of the earring where the pad and earring meet. - After application of the solution, leave the earring open until the area treated is completely dry (cured). This will take approximately 3 hours. DO NOT USE THE EARRING UNTIL THE SOLUTION IS COMPLETELY DRIED (CURED). Have rings that are to loose. I tried the metal inner ring kind but could never get them to fit or stay inplace at all. I've been watching for this for a while and now that I've found it I'm getting some for myself AND my sister. It looks like it would work. It looks like a customizable option that can be removed when rings fit differently. The obvious....help's if a ring is too large. Don't want to resize rings....may put weight back on someday. Tired of my rings slipping around on my fingers. This looks easier to use than the other two size adjusters you sell. My rings are too large. to make some of my larger rings to fit better. I have used it before and it really works! I've lost weight and my wedding ring slides off. I'm afraid of loosing it, so, hopefully, this will work. I need a slight ring resize. have a ring I adore that no longer fits. Hope this will solve the problem. In using other ring guards I have had no luck what-so-ever. My jeweler placed gold balls on my existing rings and they work wonderfully. Thought I would try the same solution with the tube. I need this item to help with my loose rings. Because some of my rings are a little too big. Haven't tried it yet, but it looks like it might be a good solution to my problem with loose rings. Have lost weight and ring slips off finger. My fingers seem to be getting leaner and my rings are falling off. This should fix the problem without the expense of a jeweler fee. Looks useful. Will see whether it works! Can this product be used on plastic? BEST ANSWER: Thank you for your question. We see no problem with using this on plastic.We hope this information will be of help to you. What is the life of this product inside the ring? BEST ANSWER: Thank you for your question. This last approximately 2-3 weeks. We hope this information will be of help to you.